Let me preface this review by letting you all know that all I want in this life is to read books about the fae. Seriously, give me a rainy or snowy day, a big hot cup of tea or coffee, and a book involving anything to do with faeries and I’ll be a happy woman. 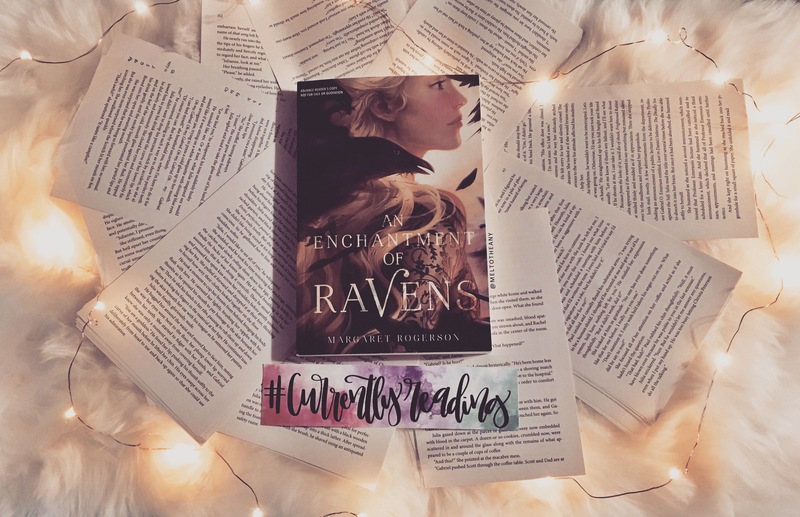 I was completely captivated and entirely immersed in Margaret Rogerson’s debut novel, An Enchantment of Ravens. This story is about a young human girl, Isobel, who is from a city, Whimsy, which lives in a constant state of summer. She is a very talented painter, who focuses on portraits for fair folk subjects from the fairy courts, and in return they grant her different enchantments. But she has to make sure the wording is precise, because the fae in this book are rather mischievous creatures that excel in trickery. Isobel is very well known by the fae for her painting Craft. See, in this world, even though the fair folk are magical and immortal beings, they are unable to ever create. This means painting, drawing, writing, even tasks like cooking. And Isobel is the most talented and beloved painter among the fair folk. She has many regular fair folk clients, but her world completely changes when she gets a much unexpected message that she will soon be painting the prince of the autumn court, Rook. Isobel gladly accepts, but makes the deadly mistake of painting exactly what she sees, which is mortal sorrow in his eyes. This simple and overlooked minor detail ends up making Rook look weak and all the fair folk to look down upon him. Rook then rushes back to Whimsy to collect Isobel herself, and together they embark on an adventure to right the wrong of painting human emotion on a fair folk that is supposed to feel nothing. That is, until Isobel and Rook start to develop stronger feelings for one another and they break the Good Law that the Adler King set in place, which states that a fair folk and a human can never love one another and that it will be punishable with death. Besides Isobel trying to correct painting the emotion, while also trying to keep her emotions in control, we have the Wild Hunt that has fae beasts constantly after them, too. We also have the Green Well, which will change you into a fair folk with just one sip, but for a very high price in an artist’s eyes. And right before our eyes, we get to see a beautiful story of sacrifice and love be painted. Also, this for sure has A Court of Thorns and Roses, by Sarah J. Maas, feels to it. I just seemed to be constantly reminded of ACOTAR while reading this story. Maybe it is because both stories star fae and take place for a majority in the spring court, but either way this feels like a YA ACOTAR, but Rook is way better than Tamlin. This story held very true to fae folklore and mythology: the fair folk cannot lie, they have negative reactions to iron, they are very vain and very overly confident, they eat “interesting” food, and they wear glamour to hide what they truly look like underneath. I loved all of these aspects and the way they were seamlessly incorporated. Isobel is an amazing female protagonist that I felt honored to read about. She was so selfless and was willing to do anything to protect her family. Also, she wouldn’t let anyone or anything interfere with her passion for art and it warmed my heart completely. She was so smart, so caring, and so determined. I loved her and she is easily one of my favorite characters of all time. The side characters in this book were simply amazing, too. Lark, Gadfly, Aster, March, May, Emma, I loved them all. I can only hope that Margaret Rogerson does not stop creating stories set in this world. There is so much potential here, and I cannot wait to see what she does next. My only real complaint is that I just never really believed, in my heart and soul, Rook and Isobel’s feelings for one another. I feel like it doesn’t make sense on either of their sides, either. Like, Rook was burned once before and Isobel had a family tragedy that made her very weary of all things fae in general. Yes, she spent a few weeks painting his portrait, but they even said they didn’t speak that much to one another. It was like a weird type of instalove, which never felt 100% authentic. Yet, the true love story of this book, in my eyes, is the love between humans and being able to have an outlet to create art. I truly believe this story is a love letter to artists of all kinds, or people in general that can’t imagine a life without being able to create. I loved this underlying message, and I loved how Isobel never took her gift for granted, but instead used it as a solution to a problem multiple times. This story was a gift to read. The imagery was expertly crafted, the prose was beautiful, the characters were fantastic, and the story was absolutely addicting. This three-hundred page stand alone YA fantasy is very fast paced, immersive, and very easy to read. I read this in two sittings and once I turned the last page my only wish was for more. Also, can Charlie Bowater do more cover art now, because this cover is nothing short of breathtaking. And it’s a perfect match for the beautiful story that is inside. I completely recommend this upon release (September 26th, 2017) and I have nothing but high hopes for Margaret Rogerson and this stunning debut novel! I wish her all the success in the world and I selfishly hope she doesn’t leave this fae world anytime soon. The quote above was taken from an ARC and are subject to change upon publication. I NEED to find a review copy of this book! I fell in love with the cover, and it sound like the story is just as good. Thanks for reviewing it, you’ve made me want to read this even more! Weeeeeeell, I’m gonna have to go pre-order this now. Hahah this review was amazing and this book sounds right up my alley. I never get tired of a good fae story. Yeah, I think I’m actually going to preorder it too, because I liked it so much! I woke up sad I didn’t have anything left to read of it! Hahaha. Bahaha that is the best and worst – when you’re just so sad for a book to end, but it’s because you loved it. UGH. OoOOo This looks good! I love the title, too! Great review I love anything Fae related and can’t wait till this comes out. That cover is absolutely brilliant. So glad to hear it has a good story as well! Thank you, Marie! I also blame myself, maybe I just had it too hyped up, because it was my second most anticipated release for the rest of the year. But either way, it was still a good and whimsical and solid read. Hehe. Did you draw that “Currently Reading” sign?? If so, it’s beautiful and I wish I could draw like that! Hi Melanie! I really loved and appreciated this review for AEOR! It’s my most anticapted release and I truly hope this isn’t disrespectful but I was wondering if there was anyway you would let me trade/borrow for AEOR. I won’t be able to buy it when it comes out and would love the chance to read it, or if I could pay for shipping, read and ship it back? I promise to take care of it! If not that’s okay, I understand! I’m still new to this so please forgive me if I went about this wrongly. I was excited to read this book anyway, and after reading your review I’m even more so. Thanks for posting!